Children fall. Bumps and bruises are simply a part of the childhood experience. However, especially for young athletes, some types of falls and hits can cause a serious condition: a concussion. Concussions aren’t a newly identified condition; we’ve all heard about them for years and years. However, in more recent years, the medical community has begun to recognize how dangerous concussions can be, especially for children. Why Do I Need to Know the Symptoms? While coaches, lifeguards, and athletic trainers are often trained at assessing whether a child has experienced a concussion after a potential concussion-causing impact, parents are an essential line of defense. This is because concussion symptoms often don’t appear until long after the injury occurred. Parents know their children; they know their children’s sleeping patterns, moods, and levels of awareness more than any outsider ever could. 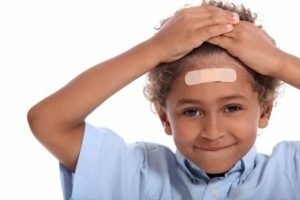 Therefore, if parents are trained at recognizing the signs of a concussion, they are able to get their children the proper medical attention, even if the symptoms don’t appear until hours or days after the event. What Are the Signs of a Concussion? The Centers for Disease Control and Prevention breaks down the signs of a concussion into two categories: observed symptoms and reported symptoms. In some cases, symptoms may be evident immediately after the accident, but other times, symptoms do not appear for hours or days after the impact. Either way, a concussion is a serious injury that requires medical attention. What Do I Do If My Child Shows Symptoms? If your child has experienced an accident where there was an impact to the head or significant “jolt” to the body, it’s important to continue to watch for symptoms of a concussion. If symptoms arise, seek medical attention immediately. Swimming, whether recreationally or competitively, is a low-risk sport in terms of the likelihood of experiencing a concussion-causing impact, but the truth is that any child can get injured at any time. At Premier Aquatic Services, our team is dedicated to teaching children how to be safe and educating parents on issues relating to safety and first aid. To learn more about issues relating to your child’s health and safety, sign up for one of our classes or follow us on Facebook.